Rega Planar 1 Plus review | What Hi-Fi? The new Planar 1 Plus is essentially a Rega Planar 1 turntable with the Rega Fono Mini A2D built in. Both are Award-winning products, of course, and Rega says it only felt natural to combine them together. We absolutely agree. At £329, the Planar 1 Plus only costs a tenner less than buying the Planar 1 (£249) and Fono Mini A2D (£90) separately. Which makes this a most straightforward test of which option is better. Placing the Planar 1 Plus next to the Planar 1 results in a quick game of spot-the-difference. Apart from the logo printed in the corner, the two decks are virtually identical. 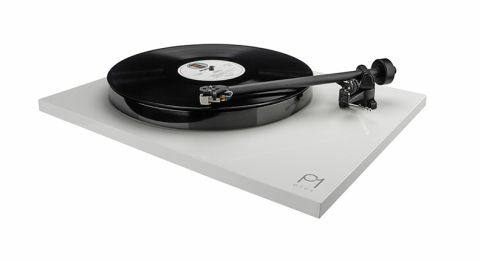 The Planar 1 Plus uses the exact same platter, bearing, RB110 tonearm, Carbon MM cartridge, 24v synchronous AC motor and acrylic plinth as the original model. If you like the sleek, minimal design of the Planar 1 (in gloss white or gloss black finishes), you won’t be disappointed with the Plus. Setting it up is easy and fuss-free, too, with Rega helpfully marking exactly where the counterweight needs to go. And that’s it, there’s no need to adjust anything else on the turntable. Any misgivings about the copy/paste design are met with the fact that all the updates are focused around the phono stage and hidden underneath a slightly modified plinth. But Rega hasn’t simply taken the existing Fono Mini A2D as is and bolted it under the deck. It has been tweaked: the USB section has been taken out entirely, and the cost saving has gone into improving the audio quality of the phono stage. We think that’s a fair trade. And sure enough, the gamble pays off. The overall sound is very similar to a Planar 1 hooked up to an external Fono Mini A2D. While that’s pretty much what we expected, it’s not the whole story here. The Planar 1 Plus sounds brilliant. It is rather lean-sounding when played straight out of the box - but the sound comes into its own after a couple of days, becoming more full-bodied and rhythmically exciting the longer you play. Rega has a knack for delivering terrifically agile, subtle and hugely enjoyable dynamics in its products, and the Plus is very much in the same mould. It’s got the drive, punch and spot-on timing to keep the momentum of Nirvana’s Come As You Are charging. Guitar strums and basslines are pulled taut, and you can hear the layers of grungy distortion as the shouty, noisy chorus kicks in. The deck has stacks of detail, too, with the tactility of each string pluck feeling oh-so-real. What also strikes us is just how clean and crisp it sounds. As a genre, grunge may trade on its down-to-earth and rather sludgy sound, but that doesn’t mean we can’t admire the production values on Nevermind. Kurt Cobain’s surly singing comes through with clarity, as does the very definite leading edge of every single note. The Plus has open, spacious presentation too, with plenty of separation between instruments and vocals laid out with very little effort. It’s also highly skilled in how it handles the high frequencies. The saxophone in Tom Waits’ Midnight Lullaby is clean-edged, sprightly and has plenty of headroom to spare – it’s never bright, but the clarity is sparkling. But the real question here is: how does the Planar 1 Plus sound compared with the Planar 1 hooked up to the Fono Mini A2D? The answer is: very similar, but with different emphases in each of their presentations. The Planar 1-plus-Fono set-up has a touch more authority and muscle. Nirvana’s choruses hit you with more attack and punch through the Planar 1/Fono – it favours more grunt, while the Plus veers towards a leaner, more refined character. Through the Planar 1/Fono, the lush, heavily textured bassline in Michael Jackson’s Billie Jean sounds more brooding, like it’s slinking its way down a dark alleyway. Through the Plus, it’s more like taking a stroll on a freshly surfaced street. The Plus, however, is cleaner, leaner and times a little better. It’s not quite as muscle-bound, but it does sound solid and punchy - and that extra level of clarity and detail really shines through. The Planar 1/Fono sounds thicker by comparison. This new Plus sounds like it’s shed a few pounds and cleared a few cobwebs away. Stripping out the digital circuit from the phono stage helps achieve the Plus’s cleaner sound, as does the fact that there isn’t a tonearm cable with its extra plugs and connections between the arm and the phono stage. The connecting wires are soldered on directly onto the phono board in the Plus - which means a much shorter signal path, and fewer opportunities to pick up interference. On the flipside, having separate power supplies is where the extra authority and muscle comes from with the Planar 1 and Fono set-up. So personal preference kicks in: it’s up to you if you want to trade those qualities in exchange for the convenience of just having one power supply to plug in. Apart from steering away from any bright or lean-sounding partnering kit, the plug-and-play Rega deck should slot in easily into any kind of system, whether it’s a traditional stereo speakers-and-amplifier arrangement, a Sonos multi-room set up, or even a pair of desktop speakers such as the Ruark MR1 Mk2s. While some may prefer the Planar 1/Fono set-up’s brawny sound, we find the sprightly nature of the Planar 1 Plus more fun to listen to. Either way, Rega has struck gold in combining two superb products into one. The company may conceivably be kicking itself for not committing to this venture earlier but, with the vinyl revival still in fashion and sales continuing to rise, we can see the versatile and excellent-sounding Planar 1 Plus being hugely popular. And rightly so.